Monitoring your child's health is simply part of parent life. Whether it's keeping an eye on whether or not they have a fever, or they're (constantly) teething or crying, anything that can give parents a helping hand is going to be welcomed. Sudden infant death syndrome (SIDS), more commonly known as cot death, still accounts for a significant number of casualties and many other underlying conditions can often go unnoticed. It's why we're starting to see wearables as a way of smartening up how to monitor your little one's vitals. Austrian startup Sticklett is the latest to enter the space with its smart vitals monitor for children. Mary is currently live on Kickstarter and aiming to offer an alternative solution to keeping children safe at night. Shipping is expected to commence in December, with the $200 system comprising of a tech-filled ladybug that attaches to a patch on a dedicated piece of clothing in order to track the likes of breathing, body temperature and movement. "The idea started with my two little children," says Sticklett founder Michaela Schicho. "I come from a fashion background and have experience with computer science, and I put those two together to create Mary. I wanted something that could track the likes of body temperature much more easily than what was already possible through other devices, and also have something that could let my children express how they felt more easily as they grew a little bit older. 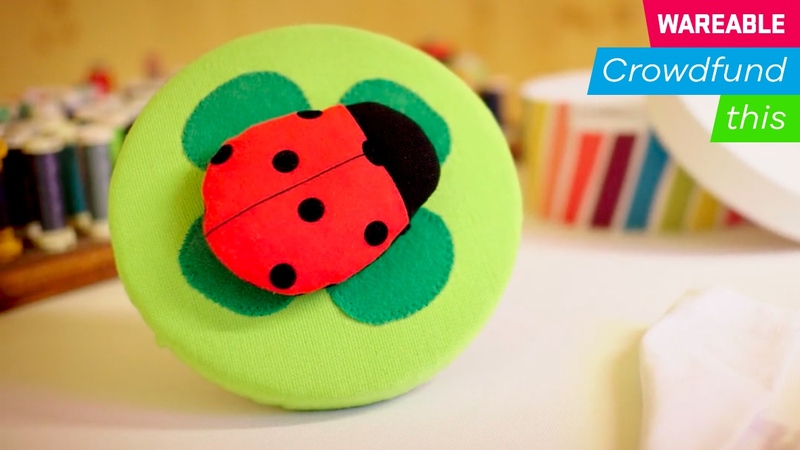 "In the first year, we put a lot of research into what else we would be able to track and what we wanted to track, and then over the last two years we've been developing the ladybug design and working through different prototypes to make it as accurate as possible." The result is the wearable currently available through the crowdfunding platform. By attaching to Sticklett's specially designed, skin-tight sleepwear, Mary's six-axis motion sensor and infrared sensor is able to record respiration, body movement and the child's temperature. With the device connected to a smartphone over Bluetooth, this data can also be sent in real-time in order for a parent to react to it. If there's a sudden increase in temperature, for example, Mary will inform the parents through an alarm on the smartphone. And because it has a built-in SIM, parents are able to receive updates from anywhere. "To get the right level of accuracy has probably been the biggest challenge," Sticklett's Lukas Brunnbauer says. "Other vital monitors monitor the oxygenation or pulse of the baby, but we check the chest movement to give parents an immediate alert. If your tracking relies on pulse, it's not as effective, because breathing has stopped well before the pulse does. And so developing the accuracy to detect these chest movements was vital." And although monitoring small children is perhaps the priority for Mary, it's not limited to just infants. Sticklett indicates that the system is able to be used until the age of 10, with chronic conditions such as sleep apnea able to be monitored through the device's breathing tracking. "What we're intending to do, on a long-term basis, is assist children with broader conditions, such as epilepsy and sleep apnea," Brunnbauer continued. "We want a system that's able to pick up long-term data and help doctors with treatment. We're not a medical device, we can't diagnose anything, but we can monitor and provide an insight into when it all happens. "For example, if a child has a condition which means they suffer from fevers during the night, you might know that, but it's important to know when it's happening so you can react to it at the right time," he said. Right now, the aim is to get Mary into the hands of as many parents as possible, with Schicho noting that the crowdfunding campaign was the first step to bringing the monitor into different markets and helping to build a community. However, with Sticklett being based in Austria, it potentially faces an uphill battle to bring its smarts to those in the US and UK. "We're constantly wondering about whether this will present a challenge. What we've found so far is that there's a much bigger affinity to these kind of products in North America and the UK when compared other areas of Europe. We don't know yet whether it will be a problem – we're based in Austria and we obviously have spoken to a lot of people in the country, and it just takes a little of time, maybe a little bit longer, to explain the idea and get people excited about it," says Brunnbauer. But the company has overcome many challenges already. Before the prototypes, testing at Carinthia's University of Applied Sciences and through trials with parents and hitting Kickstarter, Schicho admitted the team even had a long journey to settle on the name Mary. As she explained, the name derives from the German translation of 'ladybird' – marienkäfer – with this relating to Mary, the mother of God. Sticklett may not be the first company to try and introduce deeper smarts to the world of child monitoring, but there are several aspects that help separate it from its rivals. The design, chiefly, is much more friendly than some of the robotic, tech-y contraptions we've seen come to the space, and it also remains useful for much longer than the typical 18 months of a child's early life. That means the same ladybird that stuck to a child as an infant and monitored its breathing could still be providing information on any chronic conditions half a decade later. One thing to keep in mind is the subscription fee that comes attached to Mary – something which exists due to the built-in SIM we mentioned earlier – but, all in all, this is a monitoring system which appears to be on the right path. It's difficult to speak to the true accuracy of Mary, since we're yet to try it out for ourselves, but the features on board and its potential lifespan would appear to make it an option well worth exploring for parents looking for a way to monitor their child's vital signs.